Port Angeles resident Leslie Robertson, right, and Vicki Hawkins, who now lives in Chattanooga, carry a sign from Port Angeles, Wa., to the Lee Highway memorial for victims of the July, 16 shootings at the adjacent Armed Forces Career Center on Wednesday, July 29, 2015, in Chattanooga, Tenn. Robertson traveled from Port Angeles to deliver several signs of support. The original plan was one banner. After that one got filled up, it was going to be five. By the time the Port Angeles, Wash., residents got done signing sympathy banners for the Chattanooga community, Leslie Robertson had enough handwritten messages to fill 20 banners. And instead of mailing them, Robertson opted to fly across the country to hand-deliver the banners to Chattanooga City Hall and Mayor Andy Berke on Thursday. Berke said the banners will be displayed for an unknown amount of time in the library. After that, he isn't sure where the banners will go. Outdoor Chattanooga is putting on the Chattanooga Freedom Float in honor of and to raise money for the heroes who were injured and killed in the July 16 attacks. The event begins at 2 p.m. Saturday, Aug. 15. Participants can put in at the Tennessee Riverpark and then float down to the Chattanooga Riverfront. People can also enjoy the Riverfront Nights Free Music Series. Outdoor Chattanooga will shuttle people and their kayaks back to the Riverfront after the event concludes. For more information, visit the Facebook page or call (423) 643-6888. "It's clear to me people are affected way beyond Chattanooga because of this tragedy," he said. "Not only that, but the act of signing these banners is part of the healing process for them, and for us." Robertson is the founder of Revitalize Port Angeles, and earlier this summer was focused on beating Chattanooga in Outside magazine's "Best Town Ever" contest. After a fierce battle, Chattanooga won with 67,432 votes to Port Angeles' 62,130. Going against Chattanooga brought her tiny city of 19,000 together, Robertson said. And with this effort to show support, it's brought Port Angeles together again, because of the bond of the two cities. "It's almost like we're sister cities," she said. 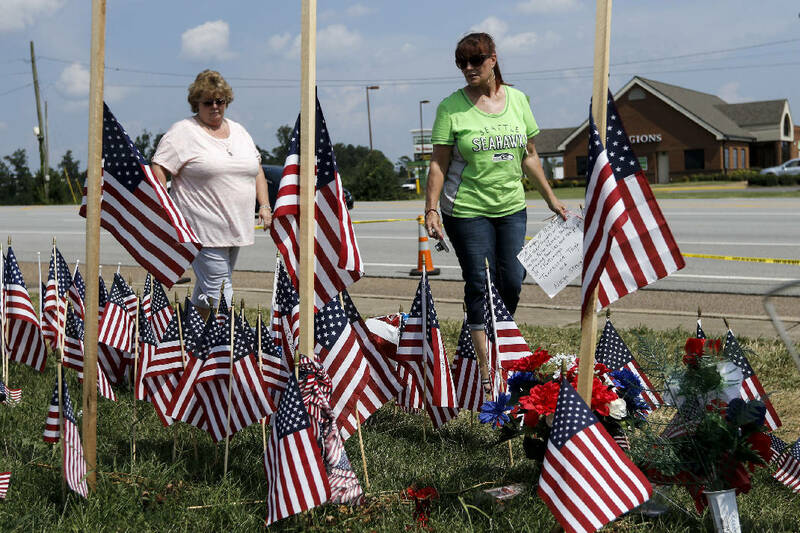 When the shooting tragedy struck Chattanooga on July 16, resulting in the deaths of five military personnel, people on Robertson's Facebook group said they wanted to do something for the one-time rival community. Robertson thought of the idea for a sympathy banner. She said the mayor loved the idea of placing a banner outside the city manager's office for residents to sign. "By writing on the banner Port Angeles citizens could express their support and prayers for the families and begin to help your community heal from this tragedy," Port Angeles Mayor Dan Di Guilio said in an email. But when word got out around town, everybody wanted a banner. The Port Angeles Fire Department, a hospital, YMCA, senior center, Wal-Mart and a band camp each had banners outside their doors, Robertson said. When she was outside a Wal-Mart asking people to sign her banner, people would stop in their tracks to pick up a pen. "You know, people stood there and really thought about their message," she said. She walked over to one of the tables where the banners lay and pointed to a message in blue Sharpie. "To the Best Town 2015," she wrote, "Our thoughts and prayers are with you — Port Angeles sends all our love to you! We (heart) Chatty! Leslie Robertson." Robertson arrived in Chattanooga on Wednesday and went first to Amnicola Highway and Lee Highway memorials and Chattanooga National Cemetery. She wanted to experience what the tragedy meant to the Chattanooga community. "I wasn't expecting this," she said, looking out at the thousands of flags and other mementos people have left at the Lee Highway memorial. What struck Berke was how the people in Port Angeles really cared about a city 2,600 miles away. Just as thousands have paid their respects at the memorials in Chattanooga, Port Angeles residents also came out in droves to offer their support. The hundreds of messages on the banners came from police officers, from City Council members, from children. As Berke walked around the room reading the messages, he turned to Chattanooga Fire Chief Chris Adams. Contact Evan Hoopfer at ehoopfer@timesfreepress.com or twitter.com/EvanHoopfer or 423-757-6731.